McAfee DLP Endpoint delivers unrivaled protection against theft and accidental disclosure of confidential data. This protection works across networks, through applications, and through removable storage devices. Enhanced virtualization support — Enforces per-user policy for multiple sessions and VDIs, which allows flexibility and better control of the data flowing to the shared terminals. Time-saving file tagging — Helps organizations set up time-saving policies based on location and application types. Security policies are preserved against file manipulation and transformation. Ironclad IP protection — Protects product designs and source codes against intentional and unintentional data loss by enforcing clipboard protection for both "Copy From" and "Paste To" actions, in addition to the new screen capture (e.g., SnagIt) protection tools. Streamlined data encryption — Integrates with McAfee Endpoint Encryption to automate content-aware data encryption policies. Centralized Management Console — Leverages McAfee ePolicy Orchestrator (ePO) management console to define policies, deploy and update agents, monitor real-time events, and generate reports to meet compliance requirements. Are you losing data without even knowing it? Your customer information, intellectual property, financial data, and personnel files may be leaving your corporate borders right now. And the perpetrators are not only hackers—they are also your own employees. Accidental and malicious data loss can occur through common channels such as email, web posting, USB drives, and uploading to the cloud—potentially costing you millions. Every day companies like yours fall victim to massive data loss through malicious and unintentional leakage of information. The costs of data breaches and remediation are extremely high. What if you could easily and effectively stop data loss? What if you could meet industry and government compliance and protect intellectual property at the same time? 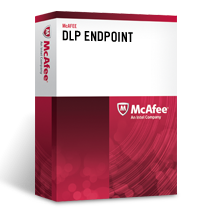 Now you can—with the comprehensive McAfee® DLP Endpoint solution. Unrivaled protection—Prevent data loss at work, on the road, to the cloud, or at home. Centralized management—Leverage McAfee® ePolicy Orchestrator® (McAfee ePO™) software to streamline policy and incident management. Complete visibility—Stop data loss before it happens by monitoring and controlling user behavior. Help protect your business against the financial loss, brand damage, and noncompliance penalties that come with accidental disclosure or data theft by insiders and hackers. Ensure that your confidential information is protected throughout your network — on servers, in databases, and across endpoints. Generate detailed reports that show auditors, board members, and other stakeholders full compliance with internal and regulatory privacy requirements. Monitor and control the transfer of sensitive information to removable storage devices, via email and instant messaging (IM), and through other communication channels — even when data is disguised. Streamline management of your entire security risk management portfolio, including McAfee DLP Endpoint, via the centralized McAfee ePolicy Orchestrator (ePO) 4.5 console. With McAfee DLP Endpoint, you can quickly and easily monitor real-time events and apply centrally managed security policies to regulate and restrict how employees use and transfer sensitive data without impacting employee productivity. You’ll protect data from threats originating from the inside, such as email, IM, web posting, USB copying, and printing. You can also stop confidential data loss initiated by Trojans, worms, and other file-sharing applications. Protection for all potential leaking channels including removable storage devices, email, web, printing, clipboard, screen capture, and network shares. Flexible classification including dictionaries, regular expressions and validation algorithms, registered documents, and support for third-party, end-user classification solutions, such as TITUS. Unique tagging technology for identifying documents according to their origin. Protect sensitive information being copied from web applications, network applications, and network shares. Endpoint discovery for local drives and email archives to protect sensitive files and emails. Furthermore, it allows employees to self-remediate any compliance violations, such as PCI, and reduces manual involvement of DLP administrators. Enhanced virtualization support to protect remote desktops and VDI solutions. Fully customized user notification and business justification dialogues help reinforce end-user behaviors. Comprehensive device management helps control and block confidential data copied to USBs, flash drives, CD/DVDs, Apple iPods, and other removable storage devices. Device parameters such as product ID, vendor ID, serial number, device class, and device name can be specified and categorized. Furthermore, different policies, such as block or encrypt, can be enforced based on the content loaded onto the devices. The Citrix device rule blocks access to the thinclient device mapping: local drives, removable storage, printers, CD/DVD, clipboard, and more. Integration with McAfee ePolicy Orchestrator (McAfee ePO) software offers real-time event monitoring and centralized policy and incident management. It allows for easy collection of critical usage data, such as sender, recipient, time stamp, and data evidence. With a click of a button, McAfee ePO software offers detailed reports to prove to auditors, senior management, and other stakeholders that internal and regulatory compliance measures are in place. Deploy and update McAfee DLP Endpoint agents via McAfee ePO software. Manage McAfee DLP Endpoint policies and incidents via McAfee ePO software. Download the McAfee Network DLP Endpoint Datasheet (PDF).